Denise Williams comes to work each day at Catholic Charities’ Higher Ground Saint Paul Medical Respite Program as a behavioral health professional. In that role, Denise provides assessment, counseling services, and client-specific mental health referrals. The Behavioral Health Professional (BHP) position was made possible by Medica Foundation and is one of the most innovative aspects of the medical respite program at Higher Ground Saint Paul. The role of the BHP is to quickly establish rapport with clients by hearing their story, assessing needs, providing brief therapy focused on overcoming barriers, advocating for support and making referrals as needed. But, ask those who come to her for services, and they put it more simply. 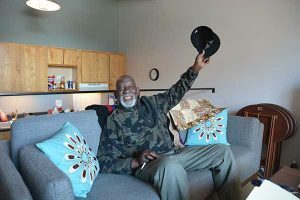 Melvin is a 76-year-old gentleman who moved from the hospital to Medical Respite Care to his own apartment. He remains thankful to Denise and those on her team who helped him regain health and learn to manage symptoms of his chronic health conditions. advocating on his behalf and making sure all of the steps were followed in order to get him safe, stable and comfortable. He can now relax and enjoy life again,” Williams said. Melvin is most appreciative of William’s help on the computer. He jokes he’s “too old” to worry about computers. Technology is necessary in navigating resources and lining up services. For Williams, going the extra mile is the most effective engagement strategy. Others have more heart-breaking stories to tell. Dezzy is just 40-years-old, but entered the medical respite program after nearly losing her life. She has multiple health challenges including extreme allergies and blood clots, but her history of domestic abuse is haunting. An ex-husband made Dezzy choose who would live—her or her dog. Williams is there to help Dezzy, Melvin and others who are struggling. Williams describes herself as a “gate keeper of the world of resources” and works to ensure patients get the services they need now and make the connections to resources that will aid them in their continuing journey. She passionately advocates for those in need, stressing that sometimes the people we’re least inclined to help are those who need it the most. Williams said the experience of homelessness can be isolating and lonely, so in her work she strives to connect clients to community. Williams has been with the Medical Respite program since doors opened in January, 2017. In that time, 209 individuals have received care there, resulting in an estimated cost avoidance to hospitals of $1.4 million. Patients generally stay in the Medical Respite unit for less than two weeks. Part of William’s goal is to help stabilize patients to safely transition out of Medical Respite into a home or shelter situation that works for them. Part of that is finding treatment, therapy or groups that will help them connect with community.